Cape Cod house designs date back to mid-17th century New England. These rugged homes withstood coastal weather, and many were expanded for growing families. With the rise of wealth in America, grander homes took the place of the simple style of Cape Cod homes. During the Depression, when cost was of utmost importance, New England style houses regained popularity and graced the American landscape. The floor plans are symmetrical and have 1-1 ½ stories. They have shutters that block wind and rain, but now are decorative items to maintain the original look. Borrowing from Greek style, columns adorn the wide front porch. These home's timeless design adds a touch of charm to any neighborhood. 3663 Sq. Ft., Width 100'-0", Depth 66'-0"
2366 Sq. 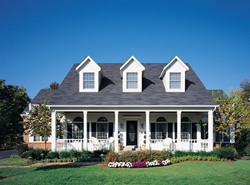 Ft., Width 68'-7", Depth 75'-2"
The Dyson Southern Home has 3 bedrooms, 2 full baths and 1 half bath. 1688 Sq. Ft., Width 53'-0", Depth 50'-0"
2128 Sq. Ft., Width 46'-2", Depth 71'-0"
The has 5 bedrooms and 7 full baths. 5722 Sq. Ft., Width 82'-0", Depth 54'-0"
Our collection of Cape Cod and New England style house plans encompasses the coastal feel associated with this charming region. We offer detailed floor plans that allow the buyer to visualize the look of the entire house, down to the smallest detail. With a wide selection, we are sure that you will find the plan to fit your needs and personal style. Browse through our collection here at House Plans and More to find the New England home plan that is right for you.